First I must say, i absolutely love YODERS. They cook like a dream and I could ask for nothing else, operationally in a smoker and that is the most important thing. Also, Yoder has been great at fixing known problems. For example, beefed up heat diffusion plate, seal on doors upgrade, etc. I love it that Yoder fixes problems once they are identified. That being said, does anyone know if there are any upcoming changes in the paint used or prep before painting or what not? It could be said that that Yoder paint not holding up is a pretty well known issue and the subsequent rust that follows. Hopefully at some point Yoder will reevaluate this. Appreciate the forum and love the cookers. 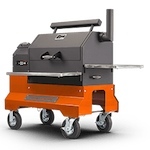 I'd second this... love everything about Yoder Smokers but hate the paint. Would love to see a fix. The factory is continually updating their production processes. In the last year there have been updates in the paint prep utilizing media blasting and the post paint baking process. Thanks herb. Yes I have reviewed, I have repainted my cooker twice in 18 months. It is very easy to repaint, which is nice, it would just nice if I didn't have to repaint and touch up frequently. Herb, is there a different brand of paint one could use to match the factory Yoder paint? Reason I am asking is I am having trouble locating the recommended paint in Canada. I know you said the YODER paint has primer built in....but it does not seem to work. Is there a recommended primer to use when we repaint? The paint is a DTM (Direct To Metal) product, that does not require a primer. I believe that the company that makes the paint, does have a primer, but requires a specific process to use it with the paint. It is satin black on all new cookers. Which should I get for mine? Need to do the outside in some places and the inside of the lid. Found it. Thanks so much. 3 cans ordered.